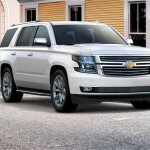 Poll: Which Of These 2016 Chevy Tahoe Exterior Colors Is Your Favorite? So, which one is your favorite? Vote in the poll, then tell us in comments if there are colors that you would like to see offered. I would like the metallic green that was on the 2015 Silverado. How come every thing I like cost more (Siren Red Tint coat)? I love red I own a red Silverado and a red Impala. I also own a 38 Chevy Street Rod Orchid Pearl and Black Cherry Metallic. In todays world any time you drive into a parking lot or a car dealership all you see is Black White or shades of Gray and in the survey Slate Gray Metallic got the least amount of votes. I don’t know about the rest of the world but I’m tired of Black White and shades of Gray. I’m really surprised Chevrolet has dropped Victory Red or as it is called now Hot Red from the Tahoe / Suburban line. Seeing how most fire departments across the USA order this color, now they have to pay extra to get a red color that doesn’t match the rest of their fleet. Or I guess they have to order special fleet colors which usually requires ordering at least 5 vehicles to be painted a special fleet color. Here in So Cal just about every large city’s Fire Chief drives a Victory Red Tahoe / Suburban not to mention some of the sales folks at Coke. No blue being on the color wheel would be a deal breaker if I was in the market for one of these. At the price the Tahoe starts at these days, there should be no up charge for any paint color. The metallics on the premiums look no better or different from the standards and it just makes no sense to charge customers on the supposed value brand of the GM family. GM needs to offer “Victory Red” for both the Yukon and the Tahoe. The 2015 GMC Yukon order book offered Victory Red as a “special color” on the SLE and the SLT models. A friend and I each ordered a Yukon SLT in Victory Red. GM accepted the order then three weeks later cancelled the order because it was on an SLT. They said they can only paint SLE’s and not SLT’s. They could not give a reason on why they could paint one and not the other. When comparing the SLE and SLT there is no difference on the areas that are painted. The difference is all in the interior options. Someone else stated that fire departments across the country order Yukon’s and Tahoe’s in “Victory Red”. 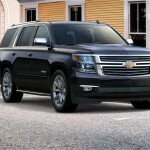 I would think that GM would welcome an order for two high end SLT vehicles in a color that they already offer. We are both willing to wait for the “paint run” when they do other orders at the same time. I always liked the white diamond tricoat color ( which I guess is now the iridiscent pearl tricoat) on any GM car as long as the interior is a lighter color other than black and gray. Here’s another write-in for bringing back Victory Red! I have a Tahoe with 397,000 miles that I’d like to replace, but won’t consider gray. Also have a Yukon XL and a Sierra 2500 to match. Would really like to add to my little fleet; help me out, GM!